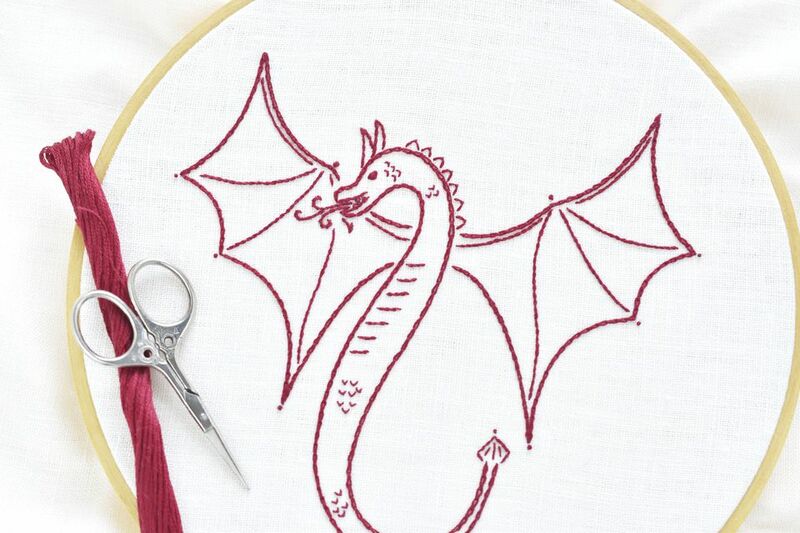 Stitch a bit of medieval fantasy with this free dragon embroidery pattern! It's a perfect design to embroider for a young knight who dreams of slaying dragons, a fan of all things fantasy, or even someone who cheers for a Welsh sports team (because their flag features a red dragon!). The flying dragon isn't too scary, but it's not exactly friendly either. It's a serpent-style dragon with a balance that makes it good for all ages. This pattern uses a handful of basic stitches, so even beginners can tackle it. But because the design has some nice details, it's anything but simple. Especially if you want to embellish it with some fill stitching or even metallic threads. It's also designed for redwork, so you can stitch the entire pattern without having to change colors! When you finish with the embroidery, frame your dragon to use it as wall art, sew it into a pillow, or you could incorporate it into a quilt! Now, get your embroidery supplies ready and start your stitching fantasy! Download the JPG dragon embroidery pattern and print it on standard size paper or directly onto sticky-backed water-soluble stabilizer. Set your printer to print the page horizontally and so the image fills the page. This results in a motif that fits well within an 8-inch embroidery hoop. If you're working with water-soluble stabilizer, peel off the backing, and position the material on your embroidery fabric. If you're using another pattern marking method, trace or transfer the design to the fabric. Place your fabric securely in an embroidery hoop and get ready to stitch with our color and stitch guide! This pattern works perfectly for redwork, as shown. Using a similar method, it would also look great stitched in purple or green. And you could even stitch this in black on black fabric for a striking design that puts the focus on the texture of stitches. You can also choose to make this dragon full color, choosing shades that create a dragon from your own imagination. With any outlined pattern, you can choose just about any stitches you like to use as long as they make sense for particular lines and shapes. With this flying dragon, that might even include filling in areas with types of satin stitch. And while there are lots of ways to stitch many areas of this pattern, here's a quick guide to get you started with the basics. Work with 2 strands of embroidery floss throughout the design. Embroider the outlines of the wings and body with chain stitch. Use french knots for the eye and the decorative points on the wings and tail. Make the small lines inside the tail with ​straight stitch. Stitch all the V-shaped scales, spikes, and teeth with fly stitch, keeping the tacking stitch small. Work the remaining lines on the wings, body, and head with stem stitch.